In the Point St. Charles of the author's childhood people move for one of two reasons: their apartment is on fire, or the rent is due. Starting in 1968, eight-year-old Kathy Dobson shares her early years growing up in Point St. Charles, an industrial slum in Montreal [now in the process of gentrification]. 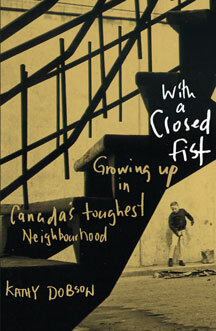 She offers a glimpse into the culture of extreme poverty, giving an insider's view into a neighbourhood then described as the "toughest in Canada." When student social workers and medical students from McGill University invade the Point, Kathy and her five sisters witness their mother transform from a defeated welfare recipient to an angry and confrontational community organizer who joins in the fight against a city that has turned a blind eye on some of its most vulnerable citizens. When her mother wins the right for Kathy and her two older sisters to attend schools in one of Montreal's richest neighbourhoods,Kathy is thrown into a foreign world with a completely different set of rules, leading to disastrous results. Kathy Dobson has a B.A. from the University of Waterloo and two certificates in social work. A journalist, her work has appeared in the Globe and Mail, National Post, Ottawa Citizen, Montreal Gazette, and more. She has produced several short documentaries for CBC Radio, including one with hockey legend Bobby Orr. She lives in Waterloo, Ontario.